My wife still reminds me that when I visited her after the birth of each of our five children, and brought her a gift, none could match the clock-radio I presented her upon the birth of our son – our only son. David was the middle child with two older and two younger sisters. From the time he was a child he demonstrated seemingly tireless intensity in the things he attempted. Fulfillment came twenty-four years later upon graduation from the Police Academy in Waterville, Maine. A “P.K.” (Preacher’s Kid), David endeavored to please his dad and struggled with a vocation choice – thinking he might not please his dad if he didn’t become a pastor or missionary himself. 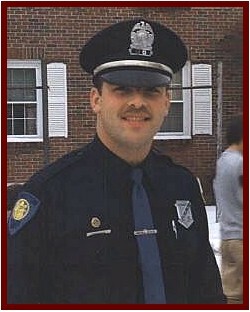 If law enforcement was God’s will for his life, the encouragement from dad was for him to become the best police officer possible… and he was, but only for two years. Just a month before his twenty-seventh birthday, on a hot, humid Saturday afternoon, David’s life on earth came to abrupt close – ambushed and gunned down by someone he was trying to help. With one hour to go on a double shift he was working for fellow officers, David again unselfishly demonstrated his tireless energy by responding to a reported accident call to assist two other officers in their reports and investigation. 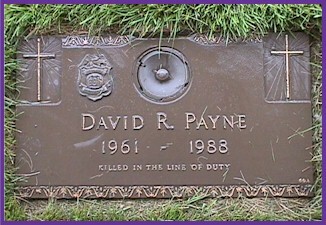 Officer David R. Payne fulfilled the purpose to which the Lord had called him, and was promoted on July 23, 1988. Over nine-hundred law enforcement officers, plus another thousand relatives, friends, and others heard a clear presentation of the Gospel during the memorial service. Truly, David was a missionary! “Hereby perceive we the love of God, because He laid down His life for us: and we ought to lay down our lives for the brethren” – 1 John 3:16. Only one son… his life given – so that others may live. God’s Only Son… His life given so that you may live eternally – 1 John 5:11-13. Do you know the “peace with God” Romans 5:1 speaks about? I have started to stop all the Police Officers I see and spread David and his Dad Rev. Ray ” dad ” Payne’s story. Father and son selflessly served and gave their lives so that others may live. David by fighting evil criminals and Rev. Ray thru his ministry lastly to the men and woman victom’s and their families in the aftermath of 9/11. To the family, everyone I meet sends you their heart felt greetings and sorrow for your loss.